Each board is unique in shape and wood type. Price on request. 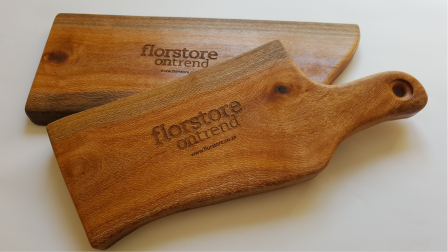 Solid Wooden Boards for serving cheese platters, snacks and light meals. For use in the kitchen or at the table. Boards can be engraved with any variety of unique designs showcasing our beautiful proteas, unique heritage places, African animals or your choice of quotation or favourite saying. Boards are finished with a coat of vegetable oil. Care: Use a regular mild dish soap or a pH balanced soap. Rinse in warm water. If your boards start to look or feel dry, re-hydrate them with a coat of vegetable or olive oil. Never soak them in water or place them in dishwashers!